Born in Tegelen (L) as the son of a manufacturer of roofing tiles, Caspar Franssen had several jobs before in 1883 becoming an overseer for the office of P.J.H. Cuypers. 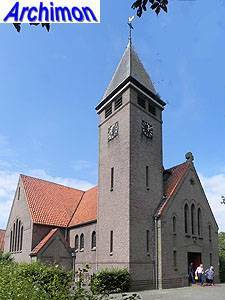 His first project for Cuypers was the restoration of the church in Sambeek, but according to some sources Franssen's first architectural experience was the restoration of a chapel in Lomm in 1881. At the Cuypers office Franssen became a trained architect. 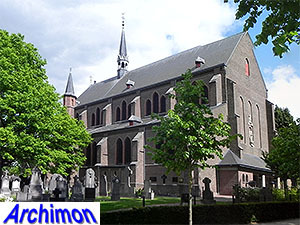 In 1888 he started his own office in Tegelen, which moved to Roermond in 1892. He continued his successful career until his death in 1932. His son J. Franssen continued the office for several more decades. 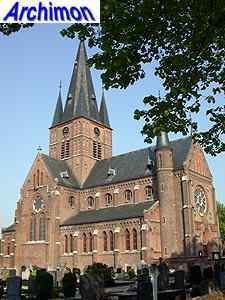 Franssen is best known for his churches, which were mostly designed in a conservative neo-Gothic style, although there were several neo-Romanesque designs as well. In all he built ca. 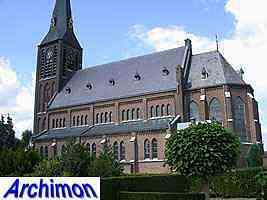 40 churches, mostly in the dioceses of 's-Hertogenbosch and Roermond, while he restored or rebuilt many more. 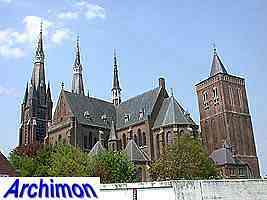 Besides churches, he designed schools, monasteries, houses and other types of buildings. The following is an incomplete listing of Franssen's work. Complex with brewery in neo-Gothic style. Later extended and partly replaced. Restoration of a medieval church. Reconstruction of the two western traves of the nave, as well as the addition of a new facade. Heightening of the stair-turret near the choir. New traceries of natural stone. 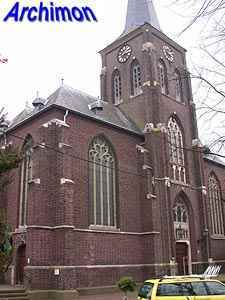 During a restoration in 1975-1977 most of the pinacles added by Franssen were removed. Three-aisled cruciform basilica in neo-Gothic style, incorporating a 15th-century tower. 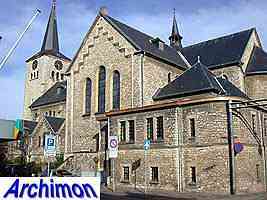 Replacement of medieval choir by a transept and a new choir. 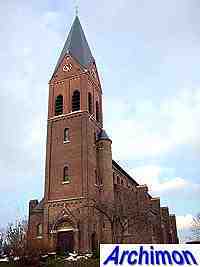 Neo-Gothic tower of four segments for an older church which was later demolished. Three-aisled neo-Gothic cruciform basilica with big square crossing-tower. Neo-Gothic pseudo-basilican cruciform church with tower, incorporating parts of a 15th-century church. Big three-aisled cruciform neo-Gothic basilica, inspired by 13th-century French Gothic. Choir with ambulatory and radiating chapels. Tower with corner-turrets. Three-aisled neo-Gothic cruciform basilican church. 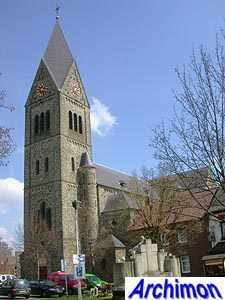 Neo-Gothic tower for a church designed by C. Weber. 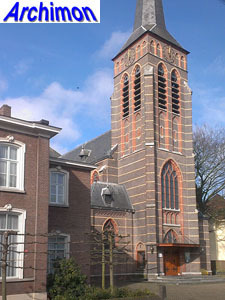 Three-aisled pseudo-basilican church in neo-Gothic style, incorporating an older tower. 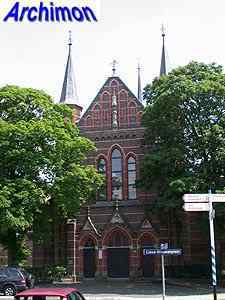 Three-aisled cruciform basilican church in richly ornamented neo-Gothic style. 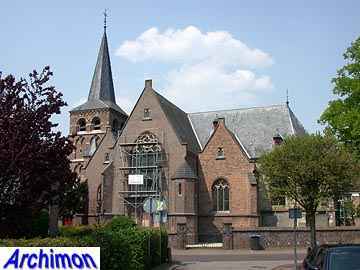 In 1897 this church won a golden medal in Brussel (Belgium) for the most beautiful village church. Destroyed in 1944. 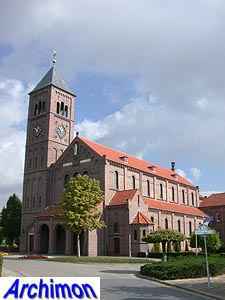 Franssen's first church in neo-Romanesque style. Three-aisled basilica with a short choir with semi-round apse. Tower destroyed in 1945 and rebuilt in 1950-1951. 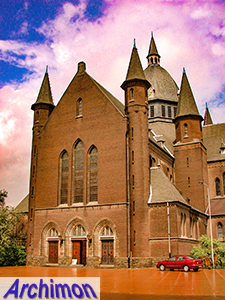 Three-aisled neo-Gothic basilica. Tower with octagonal upper segment. Three-aisled cruciform basilica in a combination of neo-Romanesque and neo-Gothic styles. Wooden octagonal crossing-tower. A tower was planned but not built. 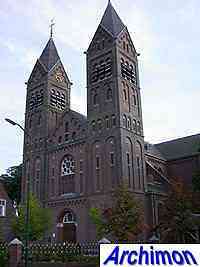 Three-aisled neo-Gothic basilica. In 1929 C. Roffelsen added two more side-aisles. 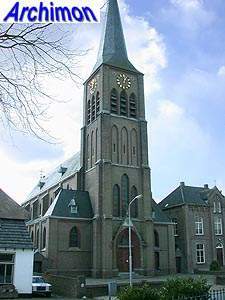 Three-aisled neo-Gothic cruciform basilican church in neo-Gothic style, incorporating an older tower. One of the side-aisle is narrower at one point because of a grave. Polygonal transept-arms. Tower damaged in World War Two and in 1956 heightened by J. Franssen. Three-aisled neo-Gothic cruciform basilican church. Tower of four segments, crowned by an octagonal spire, balustrade and flanking turrets. Three-aisled neo-Gothic cruciform basilican church. Damaged in 1944 and repaired by architect S.J.P. van der Sluijs. 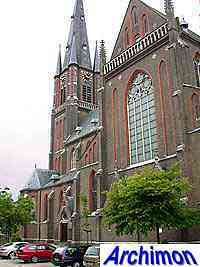 Three-aisled neo-Gothic basilica. 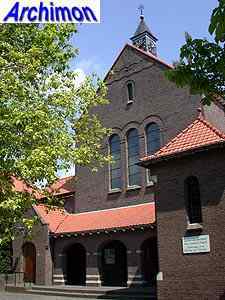 The facade is flanked by two stair-turrets, the transept has polygonal closures. Three-aisled cruciform basilican church in sober neo-Gothic style. Neo-Gothic cruciform pseudo-basilica incorporating an older tower. Executed in marl. 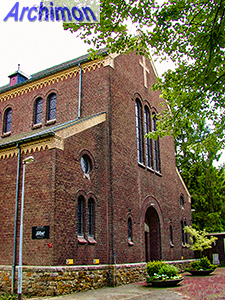 Big chapel in neo-Gothic style. Neo-Romanesque three-aisled basilican church. Side-aisles extended along the choir. Choir and side-aisles are closed with semi-round apses.Front with two towers. 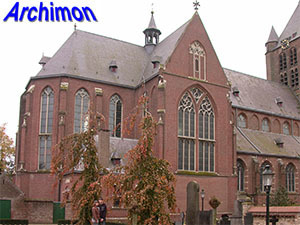 U-shaped monastery in neo-Gothic style with big chapel. Expansions in 1921 and 1925. 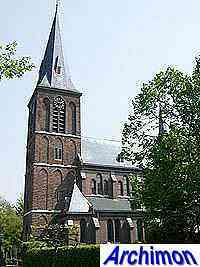 Three-aisled neo-Gothic pseudobasilica. Tower designed by B. Goddijn and added in 1953-1955. 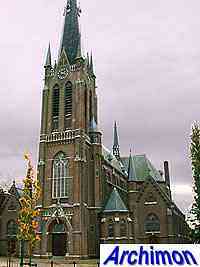 Three-aisled neo-Gothic basilica with tower of four segments and a tall spire. Choir enlarged in 1934 by F. Franssen. Three-aisled cruciform basilican church in Neo-Romanogothic style. Two towers at the front. Strange proportions, like the short nave and choir. First time Franssen used 'climbing' vaults in the side-aisles. 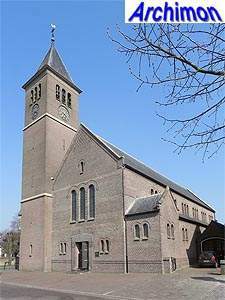 In 1909-1910 in Maarheeze (NB) an almost perfect copy (click here for a picture; opens in new window) of this church was built by an unknown architect, much to the dislike of Franssen. Three-aisled basilican towerless church in neo-Gothic style. 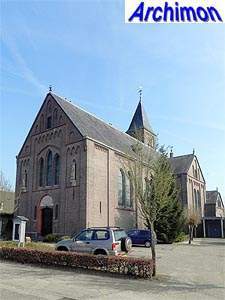 The facade was intended to be temporary and could be replaced in case the church should be extended, which never happened. 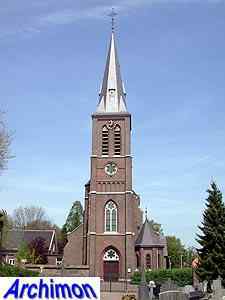 Three-aisled basilican church in neo-Gothic style, with a tower of five unequal segments. 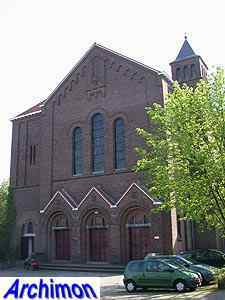 In the 1950's the choir was replaced by with a transept and a new choir. Originally one-aisled cruciform neo-Romanesque church. In 1935 very low side-aisles were added by J. Franssen. Chapel, sacristy and house. Destroyed in World War Two. 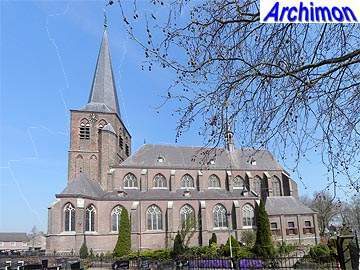 New three-aisled nave for a medieval church. 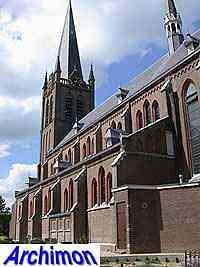 Three-aisled neo-Gothic church incorporating an older tower and choir. Demolished in 1965. Three-aisled neo-Gothic cruciform basilica with tall tower. 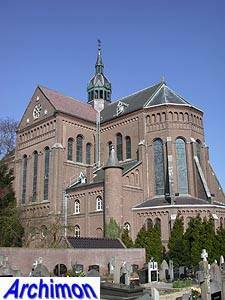 Three-aisled neo-Gothic basilica with low pseudo-transept. Three-aisled neo-Gothic cruciform basilica, incorporating an older tower which is heightened with one segment. Transept with side-aisles. All side-aisles have climbing vaults. 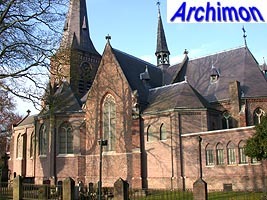 Replacement of the medieval nave by a new, three-aisled one with transept. Three-aisled neo-Gothic cruciform basilica with a two-towers front. 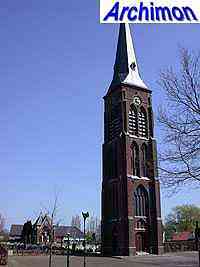 The tower of the medieval predecessor stands next to the choir. 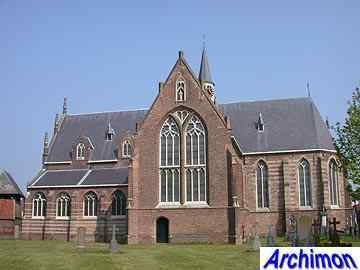 Short single-aisled nave in neo-Gothic style, built against an older choir. In 1933-1934 Jos. 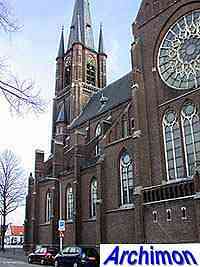 Franssen adds side-aisles, a children's chapel and a tower, while after World War Two he extends the nave. 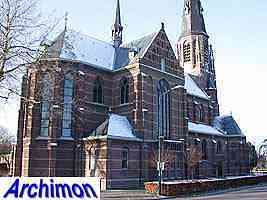 One-aisled cruciform church in combined Neo-Gothic and Neo-Romanesque style. 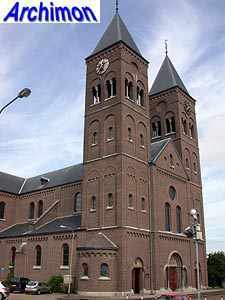 Neo-Romanesque basilica. After World War Two estended by J. Franssen. 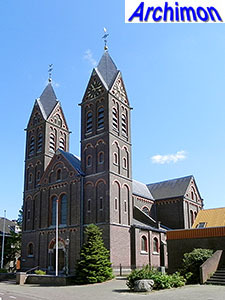 Neo-Romanesque basilica. Destroyed in 1944-1945. Neo-Gothic cruciform basilica. In 1933 extended by J. Franssen. Symmetrical school building in a style inspired by 17th-century Classicism. 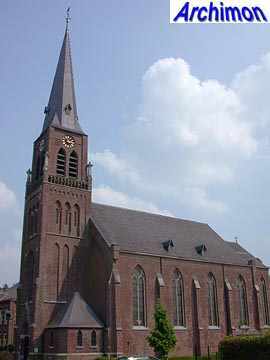 Neo-Romanesque basilican church. 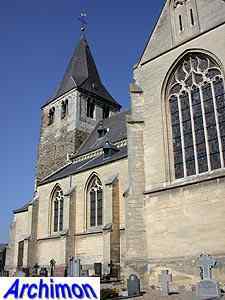 Franssen took the Romanesque churches of Ell and Belfeld as examples. The monastery is in neo-Renaissance style. 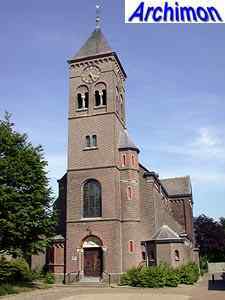 Three-aisled neo-Romanesque church with a Greek cross-shaped ground-plan and an unfinished tower. Three-aisled cruciform basilica in neo-Romanesque style. Built of Kunrader stone. Tower added in 1935, possibly designed by A.H.J. Swinkels. Neo-Romanesque cruciform basilican church. Portals and chapels added in 1938 by J.C. van Buytenen. One-aisled cruciform church in Neo-Romanesque style. Cruciform church built in a mixture of styles, including neo-Romanesque. Dome on the crossing-tower in a Baroque-like style. Built in conjunction with J. Franssen. Three-aisled basilican church with offset standing tower. Design inspired by early-christian and Romanesque architecture. Three-aisled cruciform basilican church with towers in the corners between choir and transept. Designed in conjunction with J. Franssen. Two large side-aisles transform an older church into a hall-church. Factory, designed in conjunction with J. Franssen. Three-aisled basilican church, built in a mixture of neo-Gothic and Traditionalist styles. Tower destroyed in 1944 and later rebuilt in Traditionalist style.